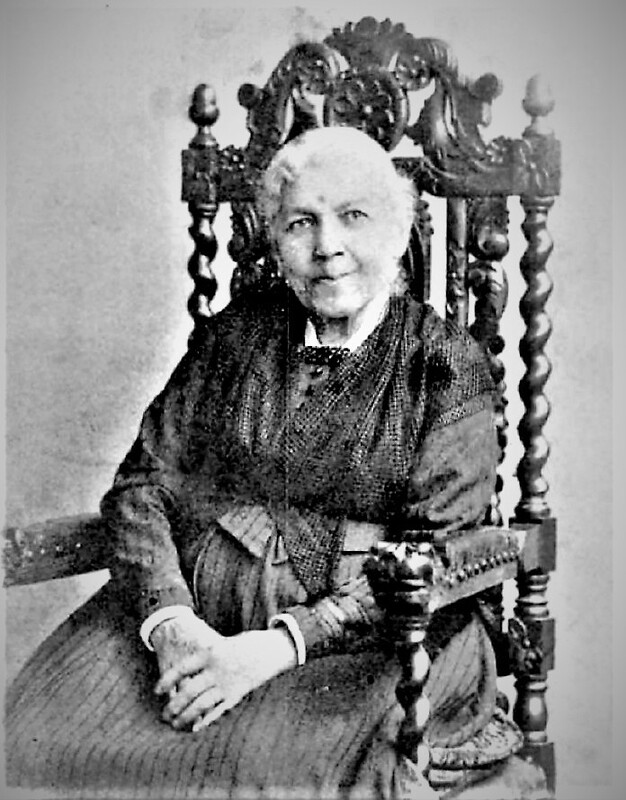 Born a slave in North Carolina, Harriet Jacobs was taught to read & write by her mistress. On her mistress's death, Jacobs was sold to a white master who tried to force her to have sexual relations. She resisted him, finding another white lover by whom she had two children, who went to live with her grandmother. "It seems less degrading to give one's self than to submit to compulsion," she candidly wrote. She escaped from her owner & started a rumor that she had fled North. Terrified of being caught & sent back to slavery & punishment, she spent almost seven years hidden in her master's town, in the tiny dark attic of her grandmother's house. She was sustained by glimpses of her beloved children seen through holes that she drilled through the ceiling. She finally escaped to the North, settling in Rochester, New York, where Frederick Douglass was publishing the anti-slavery newspaper North Star & near which (in Seneca Falls) a women's rights convention had recently met. There Jacobs became friends with Amy Post, a Quaker feminist abolitionist, who encouraged her to write her autobiography. Incidents in the Life of a Slave Girl, published under the pseudonym "Linda Brent" in 1861, was edited by Lydia Child. It outspokenly condemned the sexual exploitation of black slave women. Jacobs's book, like Douglass's, is part of the slave narrative genre extending back to Olauda Equiano in colonial times. Abolitionist Lydia Child (1802-1880), who greatly influenced Margaret Fuller, was a leader of this network. Her successful 1824 novel Hobomok shows the need for racial and religious toleration. Its setting -- Puritan Salem, Massachusetts -- anticipated Nathaniel Hawthorne. An activist, Child founded a private girls' school, founded and edited the first journal for children in the United States, and published the first anti- slavery tract, An Appeal in Favor of that Class of Americans Called Africans, in 1833. This daring work made her notorious and ruined her financially. Her History of the Condition of Women in Various Ages and Nations (1855) argues for women's equality by pointing to their historical achievements. From the Documenting the American South project of the University of North Carolina at Chapel Hill. My father was a carpenter, and considered so intelligent and skilful in his trade, that, when buildings out of the common line were to be erected, he was sent for from long distances, to be head workman. On condition of paying his mistress two hundred dollars a year, and supporting himself, he was allowed to work at his trade, and manage his own affairs. His strongest wish was to purchase his children; but, though he several times offered his hard earnings for that purpose, he never succeeded. In complexion my parents were a light shade of brownish yellow, and were termed mulattoes. They lived together in a comfortable home; and, though we were all slaves, I was so fondly shielded that I never dreamed I was a piece of merchandise, trusted to them for safe keeping, and liable to be demanded of them at any moment. I had one brother, William, who was two years younger than myself—a bright, affectionate child. I had also a great treasure in my maternal grandmother, who was a remarkable woman in many respects. She was the daughter of a planter in South Carolina, who, at his death, left her mother and his three children free, with money to go to St. Augustine, where they had relatives. It was during the Revolutionary War; and they were captured on their passage, carried back, and sold to different purchasers. Such was the story my grandmother used to tell me; but I do not remember all the particulars. She was a little girl when she was captured and sold to the keeper of a large hotel. I have often heard her tell how hard she fared during childhood. But as she grew older she evinced so much intelligence, and was so faithful, that her master and mistress could not help seeing it was for their interest to take care of such a valuable piece of property. She became an indispensable personage in the household, officiating in all capacities, from cook and wet nurse to seamstress. She was much praised for her cooking; and her nice crackers became so famous in the neighborhood that many people were desirous of obtaining them. In consequence of numerous requests of this kind, she asked permission of her mistress to bake crackers at night, after all the household work was done; and she obtained leave to do it, provided she would clothe herself and her children from the profits. Upon these terms, after working hard all day for her mistress, she began her midnight bakings, assisted by her two oldest children. The business proved profitable; and each year she laid by a little, which was saved for a fund to purchase her children. Her master died, and the property was divided among his heirs. The widow had her dower in the hotel, which she continued to keep open. My grandmother remained in her service as a slave; but her children were divided among her master's children. As she had five, Benjamin, the youngest one, was sold, in order that each heir might have an equal portion of dollars and cents. There was so little difference in our ages that he seemed more like my brother than my uncle. He was a bright, handsome lad, nearly white; for he inherited the complexion my grandmother had derived from Anglo-Saxon ancestors. Though only ten years old, seven hundred and twenty dollars were paid for him. His sale was a terrible blow to my grandmother; but she was naturally hopeful, and she went to work with renewed energy, trusting in time to be able to purchase some of her children. She had laid up three hundred dollars, which her mistress one day begged as a loan, promising to pay her soon. The reader probably knows that no promise or writing given to a slave is legally binding; for, according to Southern laws, a slave, being property, can hold no property. When my grandmother lent her hard earnings to her mistress, she trusted solely to her honor. The honor of a slaveholder to a slave! Such were the unusually fortunate circumstances of my early childhood. When I was six years old, my mother died; and then, for the first time, I learned, by the talk around me, that I was a slave. My mother's mistress was the daughter of my grandmother's mistress. She was the foster sister of my mother; they were both nourished at my grandmother's breast. In fact, my mother had been weaned at three months old, that the babe of the mistress might obtain sufficient food. They played together as children; and, when they became women, my mother was a most faithful servant to her whiter foster sister. On her death-bed her mistress promised that her children should never suffer for any thing; and during her lifetime she kept her word. They all spoke kindly of my dead mother, who had been a slave merely in name, but in nature was noble and womanly. I grieved for her, and my young mind was troubled with the thought who would now take care of me and my little brother. I was told that my home was now to be with her mistress; and I found it a happy one. No toilsome or disagreeable duties were imposed upon me. My mistress was so kind to me that I was always glad to do her bidding, and proud to labor for her as much as my young years would permit. I would sit by her side for hours, sewing diligently, with a heart as free from care as that of any free-born white child. When she thought I was tired, she would send me out to run and jump; and away I bounded, to gather berries or flowers to decorate her room. Those werehappy days—too happy to last. The slave child had no thought for the morrow; but there came that blight, which too surely waits on every human being born to be a chattel. After a brief period of suspense, the will of my mistress was read, and we learned that she had bequeathed me to her sister's daughter, a child of five years old. So vanished our hopes. My mistress had taught me the precepts of God's Word: "Thou shalt love thy neighbor as thyself." "Whatsoever ye would that men should do unto you, do ye even so unto them." But I was her slave, and I suppose she did not recognize me as her neighbor. I would give much to blot out from my memory that one great wrong. As a child, I loved my mistress; and, looking back on the happy days I spent with her, I try to think with less bitterness of this act of injustice. While I was with her, she taught me to read and spell; and for this privilege, which so rarely falls to the lot of a slave, I bless her memory.